LAPP needed impressive products and patience to establish a foothold in Chile’s food and beverage industry. Its most high-profile customer in the South American country is a globally leading manufacturer of soft drinks. Chile is a country that relies heavily on its natural resources. Extracting and processing these resources was a booming business up until 2008, yet it wasn’t long before the global economic crisis hit hard in the South American country, which has been something of a poster boy for the region. The LAPP Group, which has been supplying connection systems for the machinery and raw materials industries to the region for many years, saw this as an opportunity to tap into new markets in Chile. One field identified for having a great deal of potential was the food and beverage industry. After all, people always need to eat and drink, as trite as that sounds. That’s why LAPP decided to increasingly concentrate on this sector – not just in South America, but worldwide. The focus on this crisis-proof and growing market has been successful. As a result, LAPP in Chile has added a major drinks company to its list of customers. The Stuttgart-based global market leader for cable and connection systems now delivers products to the soft drinks manufacturer’s bottling facility in Chile for both the maintenance of existing plants and the construction of new ones. “The fact that we have developed expertise and new products for the food and beverage industry is paying off,” says Andreas Bauer, Head of Product Management PSM. Feedback gathered during meetings in Chile was also incorporated into the development of specialist products for the food and beverage industry. Examples of such products include the SKINTOP® INOX cable glands and the younger and more advanced version, the SKINTOP® HYGIENIC, which is made of high-grade V4A stainless steel and may even be used in the product zone of food-processing applications. TheSKINTOP® HYGIENIC is designed in compliance with hygienic design principles, featuring smooth surfaces and no hidden orifices in which food residue might accumulate. For this very reason, the SKINTOP® HYGIENIC doesn’t feature a hexagonal profile like most cable glands, but rather two rounded surfaces to which a wrench can be applied. 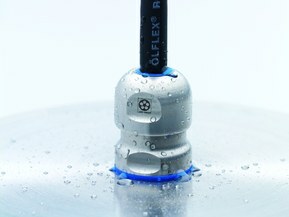 In place of an O-ring, the cable gland features a moulded seal made from a food-safe FKM elastomer above the connection thread. Contamination cannot be totally avoided, however. That’s why the cleaning squad move in at the end of each shift to treat the surfaces with aggressive cleaning agents and hot steam. The only cables able to withstand this are those equipped with a particularly resilient sheath – such as the ÖLFLEX® ROBUST and other ROBUST cables supplied by LAPP. For such applications, the material researchers at LAPP Engineering in Cham, Switzerland, came up with an alternative to conventional PUR: special TPE, with TPE standing for “thermoplastic elastomer”. The researchers adapted the mixing ratio of the polymers and worked additives such as processing aids into the compound matrix. These create an extremely smooth surface finish and aren’t rinsed out by pressure washers. Many properties of special TPE surpass those of PUR or non-optimised TPE, particularly resistance to bio-oils, fats, food acids and water. Despite renouncing PUR, cables such as the ÖLFLEX® ROBUST 200 are still resilient enough that they can be routed openly overground. And, unlike PUR, the special TPE is not hydrophilic, meaning that water does not infiltrate the material – which is a major advantage in the cleaning-intensive food and beverage industry. Despite boasting such impressive products, the success in South America didn’t just fall into the company’s lap. Tatiana Blacker, who is responsible for market development in South America, has been working for many years to break into the markets in Chile, Panama, Uruguay, Argentina, Peru, Ecuador and Colombia. “Together with colleagues, I visited many operators and plants in these countries and talked about their problems, requirements and wishes in order to gain a deeper understanding of specific market requirements,” says Blacker. These efforts were necessary, as only a portion of the orders for connection systems originate straight from the end customer, i.e. the drinks manufacturer. A larger share is awarded by the company to sub-contractors, who then procure cables and connectors themselves. In order to be considered at all for such orders, it is necessary to gain a “listing”, i.e. formal acceptance as a supplier. LAPP succeeded in doing so. For the case in question, this applies to both the end user and sub-contractors, who process a large share of the orders and receive specifications that allow them to be considered as a supplier in the first place. A strong sales partner is an important piece of the puzzle. This is particularly true in countries where LAPP does not have its own sales office – such as Chile. Desimat Ingenieria assumes this function there. This partner may operate independently of LAPP, yet it acts like an in-house sales department and therefore represents the LAPP brand. In the meantime, Desimat has built up a comprehensive warehouse stocked with LAPP products for mechanical engineering applications and the food and beverage industry, including ÖLFLEX® ROBUST and SKINTOP® INOX products. This guarantees quick reaction times if a certain part is requested urgently. Apart from this, Desimat employees are continuously trained by LAPP experts, which only serves to increase local expertise and the chance of receiving orders. This retail partner now makes the majority of its turnover from LAPP products. The first queries from the drinks company and its sub-contractors concerned maintenance work to existing plants. Desimat now supplies connection systems for new plants too. LAPP’s retail partner executed its largest order in the second half of 2017 with ÖLFLEX® cables for the bottling plant and automatic palletising process. The soft drinks manufacturer won’t be the only LAPP customer in this industry for long. Another major soft drinks manufacturer in Chile has commissioned LAPP to supply cables for the maintenance of older plants.